A very special moment for the Sir Bobby Robson legacy and all of the Newcastle United fans, plus the general public, who have supported Sir Bobby’s Foundation. Scientists at Newcastle University have said the £625,000 donation from the Sir Bobby Robson Foundation had allowed them to purchase a cyclotron which is ‘the missing link’ in a line-up of equipment that should allow them to become world-beaters. The addition of a mini-cyclotron to other advanced pieces of equipment – including a PET (Positron Emission Tomography) scanner, means scientists at Newcastle have been given a massive advantage over their rivals in other parts of the world. The new cyclotron is the first of its kind in Europe and only the second of its kind in the world. The new investigative and diagnostic unit is to be known as the Sir Bobby Robson Foundation Pet Trace Production Unit. The combination of equipment is unique in the world and puts the north east at the cutting edge and the Newcastle University team will be able to use the cyclotron to produce radioactive tracing elements that can be injected into patients with cancer and other diseases, including Alzheimer’s and Parkinson’s. This will tell specialist doctors whether the cancer is treatable and what might be the best way to treat it, while also helping specialists to target treatment, such as radiotherapy and chemotherapy. 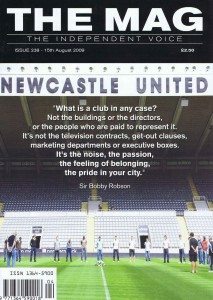 To make a donation, view messages of support, or for more information please visit www.sirbobbyrobsonfoundation.org.uk or donate by sending a cheque to Sir Bobby Robson Foundation, Room 203, Cheviot Court, Freeman Hospital, Newcastle upon Tyne NE7 7DN.